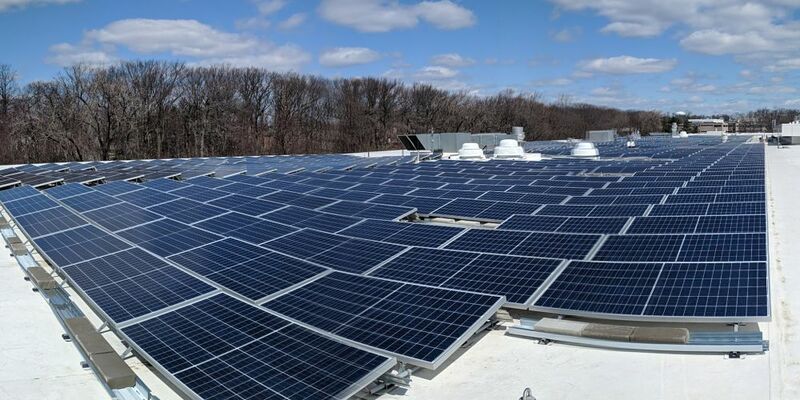 Image Attribute: Newly installed solar arrays at Unilever North America's HQ Englewood Cliffs, N.J. In 2010, Unilever launched "Unilever Sustainable Living Plan (USLP) - a blueprint for sustainable growth. ", under which the company has committed to reduce greenhouse gas emissions and find better ways to use and store natural sources of energy. To keep in line with USLP, Unilever North America installed a rooftop solar array at the company’s newly renovated headquarters in Englewood Cliffs, N.J. The solar array consists of approximately 1,200 panels and started producing electricity in April 2018. The 400-kW array will create over 500,000 kWh of electricity per year. The array is large enough to supply a portion of the electricity consumption for the building. The solar arrays are built and operated by IGS Solar, a turn-key commercial and residential solar provider. In 2015, Unilever set a target to have 100% of its energy come from renewable sources by 2030. And, it targets to become fully carbon positive. By 2020, all electricity purchased from the renewable energy grid and eliminate coal from energy mix. In turn, the company plans to support the generation of more renewable energy, making the surplus available to the markets and communities where they operate by 2030. Currently, Unilever buys renewable energy through two main arrangements, which includes issuance of Renewable Energy Certificates (RECs) and entering into Power Purchase Agreements (PPAs) with renewable energy generating companies within the operating area. But, in November 2016, Unilever forayed into a new arrangement by buying traceable renewable electricity in Malaysia, Thailand, Vietnam, and South Africa, a total of 100,000 MWh through I-REC, which is a new global standard for documenting renewable energy consumption, recognized by the Greenhouse Gas Protocol Scope 2 Guidance. In 2015, Unilever Japan switched to 100% renewable energy source for all its domestic operations, making it the first Unilever business to do so. It allowed the company to start using the Green Power stamp on products in 2016. The switch meant Unilever Japan cut its carbon emissions by 3,600 tonnes per year. In January 2017, Unilever commissioned its new Dubai Personal Care (DPC) manufacturing facility at Dubai Industrial Park. About 25% of the energy required at the plant comes from solar power and 80% of the waste-water are reused for agricultural and cleaning purposes, to ensure minimal environmental impact. The plant is a part of a plan conceived under Dubai Clean Energy Strategy. In early 2017, Unilever entered into a partnership with Unisun major renewable energy suppliers in China for installing solar arrays at former's Hefei Logistics Park, which will have a 6.8MW system installed with energy to be fully exported to the state power grid, while three other projects will be designed for net metering. Construction started in March 2017, with grid connection was expected to be completed by July 2017. In January 2017, Unilever UK & Ireland entered into a contract with GENeco for using 10,000 megawatt-hours (MWh) of biomethane at five of its sites. In May 2017, Unilever UK announced that, since April, its UK manufacturing sites are now powered by 100% renewable energy. Unilever UK is procuring its energy from 23 wind turbines farm situated at Scottish Highlands in Lochluichart owned by Eneco UK. As per the power purchase agreement, the company is acquiring 87%, or 165 gigawatt-hours (GWh), of the electricity, generated. Also, in 2017, 28 of their manufacturing sites generated renewable electricity on-site, mostly from solar and hydropower. For example, in South Asia, many of their sites have open land, which gave them an opportunity to install on-site solar panels. After successfully installing solar panels in two sites in Pakistan in 2016, Unilever replicated this at four sites in India in 2017. In March 2018, Unilever Tea Kenya signed an agreement with CrossBoundary Energy for the installation and operation of a 600kW solar power plant at the company’s Kericho tea plantation in Kenya. The plant is expected to start producing power in mid-2018 with Unilever to pay monthly power bills generated by Cross Boundary Energy who will finance and operate the plant for 15 years.